Nexus Metal Detectors warranty information. All Nexus products are custom made and manually checked for the highest quality build and performance standard. If any problem should occur it is our priority to resolve it swiftly. Any product purchased from an authorized reseller or directly from us are guaranteed for a period of 2 years from date of purchase against all manufacturing defects. The Control Box is sealed and contains no user-serviceable parts. Opening the Control Box will invalidate the Guarantee. This Guarantee does not cover: Damage due to: Dropping, impact or accident. Improper use or care of the detector. Leakage of batteries. Forced damage to the coil or coil cable. In the event of any problem, please contact us, our details are listed on the contact page. We will provide a replace or repair option and prioritize warranty items. Any item returned under Guarantee must be properly packed, preferably in the box supplied and be sent by insured carrier. The sender is responsible for any loss or damage in transit. Please remove the batteries from your detector before shipping. The declared customs value of any item for repair is none and it should be clearly stated on the documents that it is an item returned for repair. 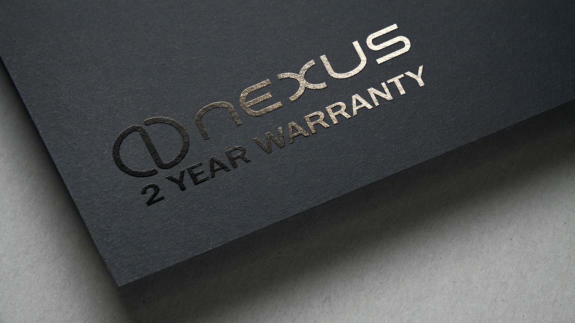 All Nexus products are custom made and manually checked for the highest quality build and performance standard. If any problem should occur it is our priority to resolve it swiftly. Any product purchased from an authorized reseller or directly from us are guaranteed for a period of 2 years from date of purchase against all manufacturing defects. The Control Box is sealed and contains no user-serviceable parts. Opening the Control Box will invalidate the Guarantee. This Guarantee does not cover: Damage due to: Dropping, impact or accident. Improper use or care of the detector. Leakage of batteries. Forced damage to the coil or coil cable. In the event of any problem, please contact us, our details are listed on the contact page. We will provide a replace or repair option and prioritize warranty items. Any item returned under Guarantee must be properly packed, preferably in the box supplied and sent by insured carrier. The sender is responsible for any loss or damage in transit. Please remove the batteries from your detector before shipping. The declared customs value of any item for repair is none and it should be clearly stated on the documents that it is an item returned for repair.